This shirt was designed for a bi-annual event featuring music and poetry that converts group donations into meals for the needy in North Texas. The events, called “Hootenannies” gather donations that raise funds for the North Texas Food Bank, the Hootenanny events have brought together poets, musicians and artists from North Texas for over a decade to generate roughly 33,000 to 41,000 meals for the hungry in their community. To make each Hootenanny event unique, a commemorative shirt is created. The shirt is then provided to those who make a donation. 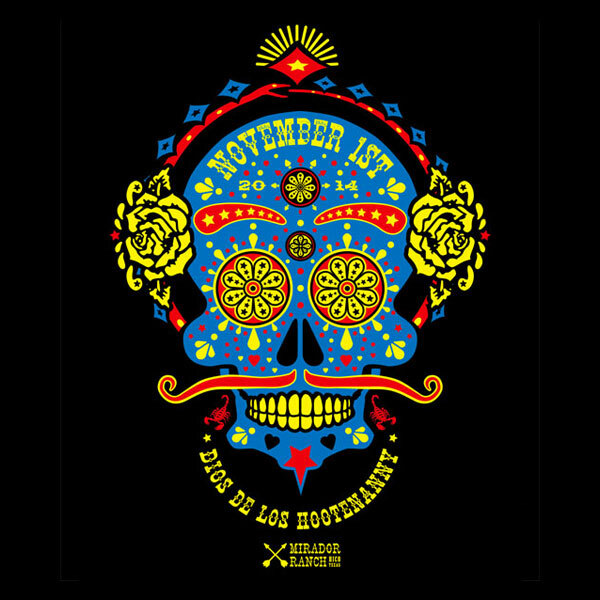 This year, the fall Hootenanny is on November 1st, also known as the Day of the Dead. 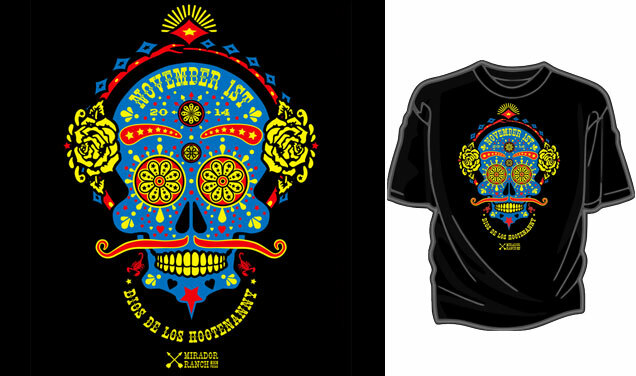 When I realized that connection, I knew that the traditional sugar skull would be an inspiration for the design of this years T-shirt. Normally carnations are pictured, but because the event is held in Texas, I substituted them with yellow roses. I also used some of the familiar inhabitants on the Texas landscape, the scorpion which also serves as a November / Scorpio reference, and the diamond-back ouroboros as a laurel. The typography among the dot and tear drop pattern on the skull provides the date of the event; and the mirrored type at the bottom acts a gold chain and pendant. 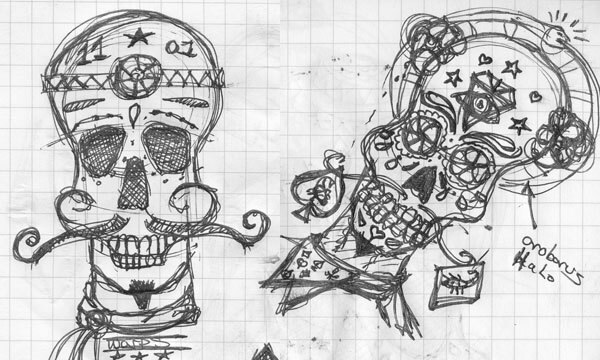 These early sketches show some ideas I was working out along the way, and below we see the two color options I provided to the client. I strongly recommended the blue skull for it’s color contrast which promotes the design elements while projecting the lighthearted feel of a black-light party, compared to the intensity of the red skull that overpowers the design details and has a strong sense of halloween. I liked the Mirador Ranch logo from the spring Hootenanny earlier in the year, but I wanted to refine it and make it more of a permanent logo option for future event collateral. The updated logo is below, if you want to compare it with the earlier iteration go here. I think you’ll agree that this logo update projects a bolder assurance with making just a few tweaks to the arrows and type. If you’re interested in my thoughts behind creating the logo, see this post.